It’s been a super busy weekend. Between making decorations for the wedding, building new garden furniture, fixing the patio and painting the outside toilet (trying to get things up together before the post wedding BBQ we have planned) I’m surprised I’ve had time to breathe, let alone cook. But I promised the guys at work some flapjacks so I’ve squeezed in a little Sunday night baking. To make these dairy free I’ve swapped out the butter and replaced it with rapeseed oil. Grease and line a tray (18-25cm). Heat the oven to 190c. Place the oil, syrup and sugar in a pan and warm on a medium heat. When the mixture is heated through add the oats, fruit and salt and stir until everything is mixed thoroughly. Pour the mix into the lined tray and pat down with a spatula. Bake in the oven for 15 minutes until lightly golden brown. When cooked remove from the oven and allow to cool. Cut into 12 pieces. Melt the chocolate (either over boiling water or in the microwave) then drizzle it over the flapjack pieces. allow the chocolate to harden and enjoy. Oh they look good I would eat most of them in one sitting. These look amazing! I want to eat them off the screen! 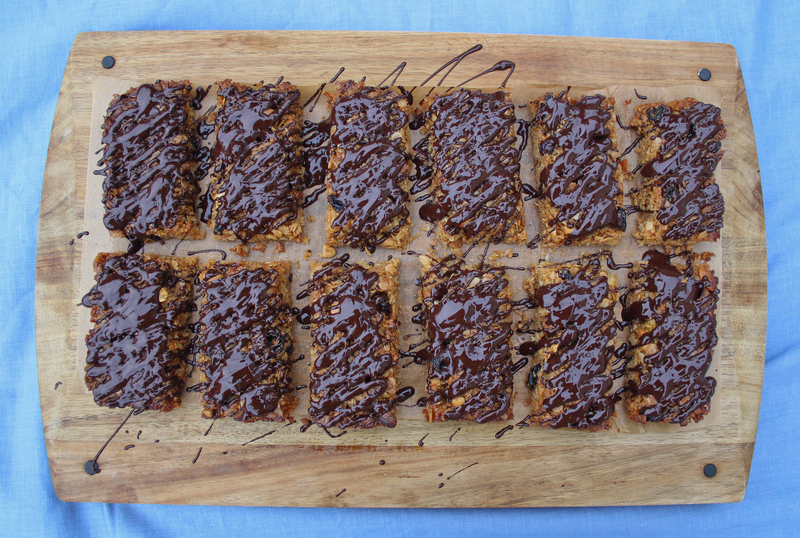 We’re big fans of flapjacks here, yours look extra decadent with the chocolate. Might try them for the birthday parties that are coming up soon here. 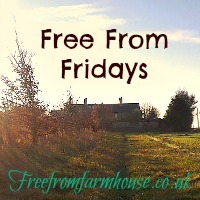 Thanks for joining #freefromfridays! Thanks for hosting! If you are a fan of chocolate these make a great snack! Full of good stuff (and a bit of bad tasty stuff) a great morning pick me up! They look very tempting. I imagine your house smelt lovely when they were cooked.